Sandi Salazar, owner of Peak Training, is a mobile fitness trainer serving the San Diego Area. 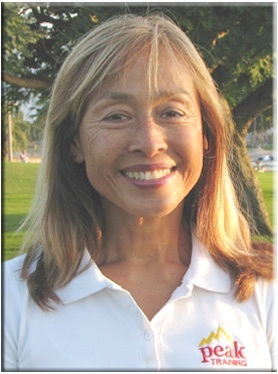 Sandi is a certified Personal Fitness Trainer with over 30 years of experience in the fitness field. She holds certificates in Exercise Science and Fitness Instruction from the UCSD extension program and in Personal Training from the National Federation of Professional Trainers (NFPT). Sandi started her fitness journey in 1971, working out at a gym of Ralph Kroger, one of the legends in bodybuilding. Sandi fell in love with a healthy, active lifestyle and the increased energy and body transformations that come with it. She left her office job to teach aerobic dance and exercise classes and never looked back. Recognizing the need for more women trainers, Sandi made the move to the emerging field of personal training in 1989. Throughout her teaching and training career, Sandi has also competed in Natural Bodybuilding competitions. Sandi has honed her approach for effective one-on-one training in her 20 years as a personal trainer. She is dedicated to giving the individual personal attention and care needed to develop a proper program for you to fit your lifestyle and desired results. then look to Sandi Salazar of Peak Training.